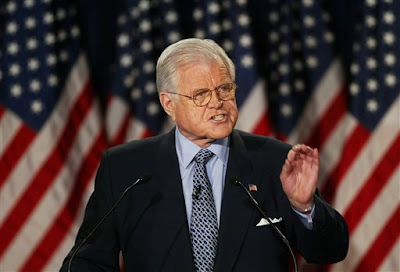 Ted Kennedy, the ubiquitous compassionate "lion of liberalism," is now dead at the age of 77, thanks to his incurable brain cancer. The limousine socialist is now being canonized by the talking heads of MSNBC, CNN, and other socialist-worshipping networks as well as the major print newspapers such as the New York Times, the Washington Post, USA Today, and many other state-cheerleading publications. We are talking about the same vile collectivistic socialist Democratic senator who supported the evil Civil Rights Act of 1964 and its provisions, including Title VII, which transferred the private property of any free enterprise to the ruling domain of the state simply by outlawing discrimination "on the basis of race, color, gender, religion, and national origin." Subsequently, pregnancy, age, and disability discrimination and the prohibition of sexual harrassment were later included in the provisions of the law, which effectively demolished employers' right to discriminate against employees by not hiring them or simply firing them, even if the employees are discriminated on those grounds. It also resulted in the creation of the Equal Employment Opportunity Commission, which intervenes in private employers' right not to hire or to fire employees if they are deemed discriminatory by the U.S. Supreme Court, the federal courts and the U.S. District Courts, and the lower courts and the U.S. Court of Appeal. He was also responsible for expanding the U.S. intervention in Vietnam in the 1960s. He pushed for evil legislation such as the Immigration and Nationality Act of 1965 (which repealed quotas on national origin, thus restricting and empowering the state's role in the immigration market), the National Cancer Act of 1971 (a vile law which launched the U.S. War on Cancer and mandated that the National Cancer Institute would be subsidized with no incentive to find cures for cancer), and the vile No Child Left Behind Act of 2002 and the Edward M. Kennedy Serve America Act of 2009. He even voted against the infamous Iraq War Resolution, which is hypocritical considering he backed the Vietnam War and the invasion and occupation of Afghanistan, not to mention backed additional Humvees for U.S. troops as a measure to keep them in Iraq. And, oh yes, let's not forget his infamous involvement in the highly-publicized Chappaquiddick scandal that transpired on the night of July 18, 1969, in which he, in an inebriated stupor, drove his 1967 Oldsmobile Delmont 88 with one of the few women who had worked on his brother Bobby's presidential campaign as a passenger off a bridge into a pond inlet. This vile maniac didn't even bother to save the life of this 28-year-old woman; instead, he swam to safety and never reported the incident until her body was discovered the next day. He only served two months in jail, when he should have served a lot longer than that. Oh, and he was a pathetic alcoholic to boot. This is the same Kennedy who pushed for the then-estimated $400 billion Medicare Drug Prescription Benefit that he, many Democrats, and the bulk of the Republican congressional leadership wanted. Just prior to his death, he took partisan measures to ensure that Obama's public option would pass. It doesn't help that his fellow collectivists in the House and the Senate and the major talking heads in the mainstream press and media are canonizing him, as though he were a Catholic saint. Even Obama eulogizes him by asserting that Kennedy was "a colleague, a counselor and a friend" and then extoled him by saying that his "ideas and ideals are stamped on scores of laws, reflected in millions of lives." Someone gag me with a spoon, please? To sum it up, this "lion of liberalism" was all about controlling other people's lives, manipulated his way to avoid criminal prosecution for murder of people in Iraq, Afghanistan, Vietnam, and a woman in his brother's campaign, lied to his constituents, and had neither any conscience nor remorse for stealing other people's money. Goodbye and good ridance to you, Teddy. Just do us a favor: don't rest in peace. Just rest in torment. I hope you get the justice you deserve in the black bowels of political hell. Perhaps you'll end up pleading for mercy to save your soul.